Hola! Look at our fantastic puppets! 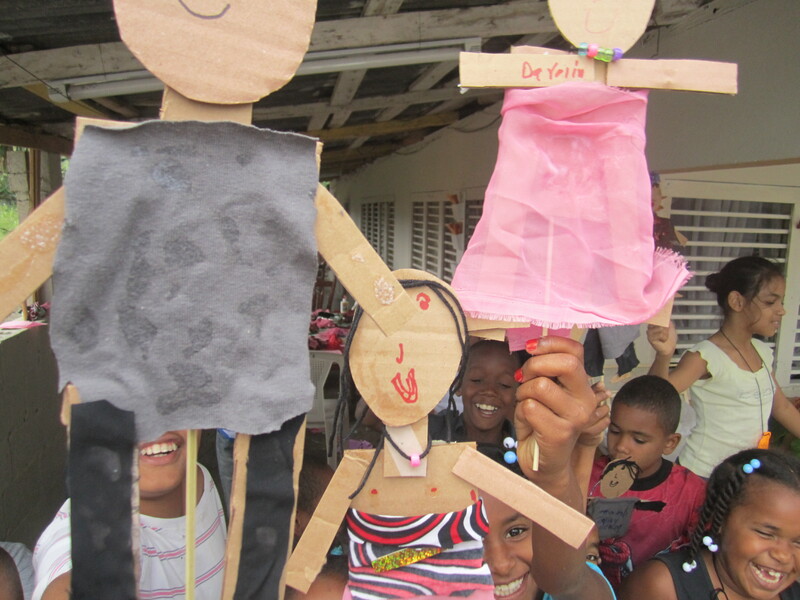 This week I thought it would be fun for the children to make puppets. A number of students had been representing faces and/or figures in their previous collages and I thought making puppets would be a great way to encourage more of that exploration, as well as provide the opportunity for the kids to “dig in” to some really exciting materials like scraps of fabric, beads, shiny paper, string, etc. We got sooo lucky because the night before the class I was thinking I’d just cut up some of Renzo’s (and my) old clothes, but Taty ended up having a super duper stash (2 barrels full!) of fantastic fabric! Thanks to Taty, we scored the perfect fabric scraps for the project…bright colors, interesting textures, vivid patterns, opaque & translucent. We did end up cutting up one of Renzo’s t-shirts as well which inspired an impressive puppet outfit fashioned by one of the older boys in the group! It was so fun to see the children so engaged in their work; the personal nature of creating their own figure/character was really powerful and I hope to continue drawing on that. any i was laughing .. randy puppet!! they haveing a good time with you there .. congratulations any! !